Published by Zondervan is a new devotional journal providing a new scripture and devotional passage each day for an entire year. Each two page spread features a beautifully illustrated full color bible passage. Whether the reader is familiar with the Beautiful Word bible or not, this devotional book is certain to become a treasured keepsake after adding your own thoughts and reflections. On each two page layout, a few widely spaced lines are provided in the side margin. The wide spacing allows ample room for any sized handwriting, although the lines themselves allow room for a few quick thoughts and not lengthy passages of journaling. I have not decided whether to keep this book as a devotional, or whether to personalize it adding my own notes and journal entries. 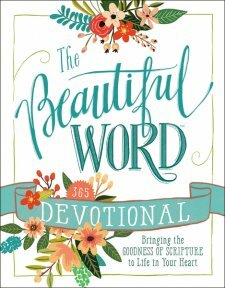 Although this is a structured journal with a devotional for each specific day of the year, it is hard to resist reading ahead and scrolling the selection of illustrated verses. As a blogger for Booklook I received a copy of this book for the purpose of writing this review.